It's been awhile since I updated the blog but it's time to knock the dust off this thing and get it tuned up for a new adventure. More on that to come but first let me catch up a little on what's been going on. The blog tailed off after our trip last year. I think we all walked around for months on a high from what we'd done. My paths crossed with the members of trip and I sure feel a bond from the experience. But I'm still a bit isolated from the rest of the group and frankly I don't run into them enough for my taste. So I took the opportunity to join them for a fall ride last October and sure enough the DRZ died 3 miles from the campground. I'm still not sure why I haven't put this thing out of my misery yet! But Thor towed me home, which I'm getting to be a master at, and I hopped on my mountain bike which is now considered essential on all DRZ adventures. I got home from that weekend and Susan was even encouraging me to just sell the bike. As much as it's let me down it's spec'ed out perfect for what I want to do with a dualsport so I tried through the Fall to convince myself that I could carry on with it. Meanwhile the Yamaha WR250R caught my eye. It has Fuel Injection which means I won't have to fuss with jets or carburetors. It's also a brand new design with some really clever features. So I started shopping for one in December but the low volume of sales has really made it a weird market. I finally landed one in March on my way back from a North Georgia ride on the DRZ. The DRZ wouldn't idle all weekend but I swear it was the best we'd ever gone down the trail together. The end for me and the DRZ was kind of bittersweet because of that weekend. But if nothing else I was getting a much newer bike that I could hopefully trust more than I would ever trust the DRZ again. 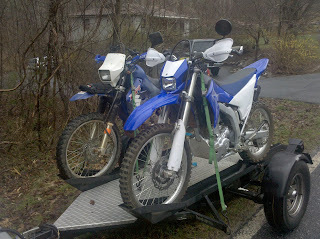 Below is the picture I took when I picked up my new-to-me 2008 WR250R and hauled it home along side my DRZ. I prayed the mad mojo wouldn't be contagious. I was excited to have a new bike but not very excited about building a new Adventure machine. I learned some things putting the DRZ together that I thought would help me make wise decisions though. But the first order of business was to sell the DRZ and my friend Dieter Wulf was interested. 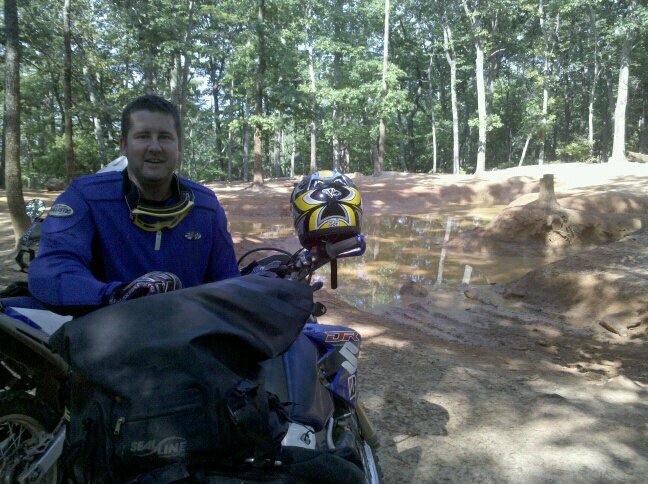 We took a ride to Uwharrie during which the DRZ ran like a champ and Dieter and I made a deal. I was happy to have the bike around and even happier to have a riding partner. Dieter is happy with the bike and has had better luck with the bike so far which I'm happy about.